YELLOWKNIFE -- A study of lakes near one of Canada's most contaminated industrial sites suggests the water immediately around Yellowknife's Giant Mine won't return to its natural state for generations -- if ever. 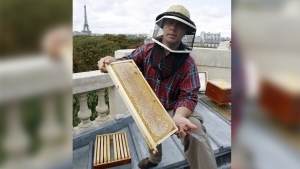 "This is going to be a contaminated site indefinitely," said Jules Blais, a University of Ottawa professor and lead author on a paper just published by the Proceedings of the Royal Society in the United Kingdom. need fix on yesterday's Giant story. Report published in Proceedings of the Royal Society in the UK, not the Royal Society of Canada. "Even when we've looked at other parts of Canada that have been heavily affected by mines, including Sudbury, we've never seen these kinds of impacts." Blais and his colleagues used sediment cores to examine the impact of the gold mine's heavy arsenic contamination on the tiny bugs and plants that live in Pocket Lake, one of the small lakes that ring the Giant property. 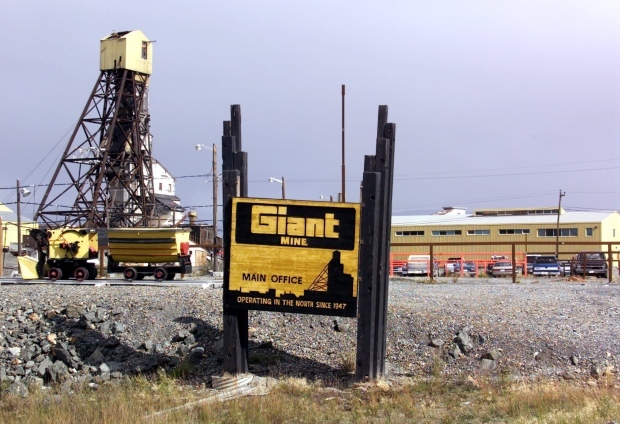 The Giant Mine operated from 1948 to 2004 and produced about seven million ounces of gold. It also left behind an environmental nightmare that includes underground caverns filled with 237,000 tonnes of arsenic and a 95-hectare surface site poisoned with 13.5 million tonnes of arsenic-contaminated tailings. Blais estimates another 20,000 tonnes of arsenic blew out of smokestacks and ended up in land and water in the mine's early days. Pocket Lake sediments from the 1960s contain up to three per cent arsenic. That means a handful of dried mud weighing about a kilogram could contain up to 30 grams of the metalloid. A lethal dose would be between 80 and 240 milligrams for a Canadian man of average weight. "We don't ever see values like that," Blais said. "These are some of the highest arsenic concentrations I've ever seen in a natural setting." Even though the mine has been dormant for 12 years, fresh sediments in the lake remain tainted with arsenic at levels that far exceed safety thresholds. Its water, too, is contaminated. The cores revealed that entire classes of tiny plants and animals -- planktons and water fleas -- were wiped out during the peak years of contamination. "We've never seen these kinds of impacts," said Blais. Those parts of the ecosystem have never come back. "Usually, after a number of decades after the peak of contamination, normally we start seeing these populations returning. Here, we don't see a recovery." The findings underscore the mammoth and unique scale of Giant's environmental liability, said Blais. "We have looked at population impacts in other parts of the world," he said. "We've never seen this kind of thing." The last company to own the mine as well as its environmental liability, Royal Oak Mines, no longer exists. The mine was established before laws requiring environmental performance bonds were passed. The federal government is in the middle of a billion-dollar, taxpayer-funded program to remediate the site. But even that cleanup, focused on the many remaining structures and vast subterranean arsenic-stuffed caves, isn't likely to restore the ecosystem in the immediate area to what it was, Blais said. "Those 20,000 tonnes of arsenic trioxide that was released to the environment are going to continue to contaminate the local environment. "That's a genie out of the bottle. It's out and it will continue to cause problems." Yellowknife gets its water from the Yellowknife River, which flows near the mine. But the river's watershed is big enough to keep arsenic levels low. The city also tests for arsenic.